Grease a 12 cup muffin pan. In a bowl, stir together cranberries, 1/4 cup sugar and orange zest. On a larger bowl, sift together the flour, baking powder, salt and the rest of the sugar. Add oil, orange juice and eggs all at once to the flour mixture and stir until moistened. Fold in the sugared cranberries and nuts. Pour the batter into muffin pan, evenly dividing the batter between cups. Sprinkle tops with coarse sugar. Bake at 400 degrees for 20-25 minutes or until golden brown. I'm curious about this recipe. I just finished one of their muffins and their were no nuts in it. I've not had the muffin before but really enjoyed it. Why does your recipe call for nuts? I made these using this recipe I didn't make it with nuts. I like it with out the nuts. There are no nuts in the Panera cranberry orange muffin-curious why the add? Agreed, had my 1st one the other day and no nuts. Same here. Their orange cranberry muffins are a seasonal item and so I wait for them every year. THERE ARE NO NUTS IN THESE MUFFINS! if you don't want nuts don't put the nuts in. If you love walnuts, put those guys in. Does it really matter that Panera does not like nuts? We don't add nuts because it's a health hazard. Too many people love them to add nuts and lower the amount of people who can enjoy them. Also the Panera muffin has whole cranberries that give you a pleasant pop of tatness and juice when you note into the muffin top. I am curious about the recipe though. I will try it sans nutsand with whole berries. I find them a little dry - I even cut the time and put the temp at 375 to watch carefully. Tried these tonight. 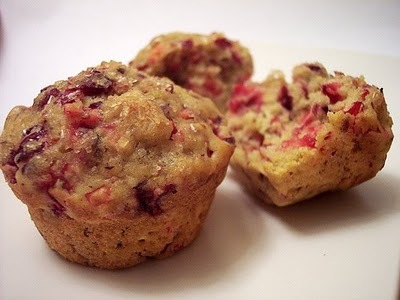 I swapped melted butter for the oil, left out the nuts, and used whole, frozen cranberries (unthawed). The batter was very thick, and I used a disher to put them in the muffin cups. I sprinkled the tops with Turbinado sugar before baking as well. They turned out pretty tasty, though not as tasty as the Panera ones. I'd go heavier on the sugared top for one thing, and possibly a bit more sugar in the batter. There's still something missing though and I can't put my finger on it. Still, not a wasted baking effort as these are yummy nonetheless. Can this recipe be used for cookies? made this recipe and took a chance on doing something different by adding 1/2 cup of frozen orange juice concentrate instead of regular orange juice and they turned out exactly like Panera's and maybe a bit better. Yeah! This is a first for me with making a great muffin. never tried making it into a cookie.